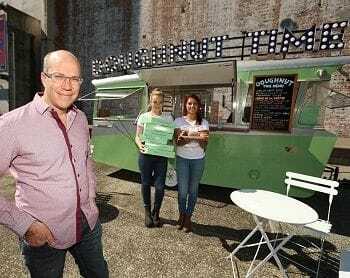 IF THERE'S a bite-sized tip Doughnut Time founder Damian Griffiths could give to budding entrepreneurs, it's to remember 'the trend is your friend'. The serial Brisbane entrepreneur behind the likes of Limes Hotel, Alfred & Constance, Kwan Brothers and Chester Street Bakery says putting a 'spin on things' has always been the way he's gone about business. Nowadays, when Griffiths (pictured below left) opens a new store, it's standard for queues around the block and social media frenzies. An ex-lawyer, Griffiths started his hospitality empire 12 years ago when owning and running backpacker accommodation in Brisbane. 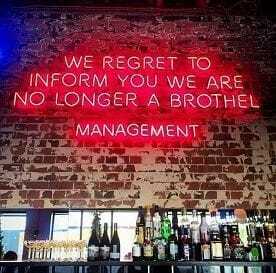 His plans were soon upgraded upon noticing a growing market for boutique, budget hotels while travelling around Europe. "My first major project in hospitality was Limes Hotel, which was the first real rooftop bar in Brisbane," says Griffiths. "From there we began developing a mini-precinct, acquiring two old Queenslander timber cottages adjacent to the hotel and converting these to what's known as A&C. "I've always just thought of myself as a customer, and because I never really think as an operational person, I'm constantly wondering what the person on the other side of the counter is thinking and feeling. "We are such a diverse group these days and our hospitality venues, bars and restaurants have really become incubators for all of our quirky little ideas." Griffiths, whose first job was a dishwasher, pulled off relaunching the former Bubbles Bath-House last year as a legitimate operation. Nestled between Wickham and Little Streets, Les Bubbles Steak & Frites Restaurant pays homage (pictured below right) to what was once a massage parlour and illegal casino rumoured to be a hotspot among politicians in the 70s and 80s. Around the same time Griffiths was pondering Les Bubbles, he was glazing over another idea in his mind. "I was travelling to Chicago and while walking the streets I found myself joining a huge queue of people, unsure exactly what I was lining up for," says Griffiths. "We already had Chester Street Bakery and noticed the donuts were becoming really popular and selling out every day. "I walked up to this hole-in-the-wall donut shop in Chicago and basically thought, this is what I want to do." Having sniffed out the trend, Griffiths says the venture didn't require a great deal of planning. He already had a space in Brisbane exactly like what he saw in Chicago. 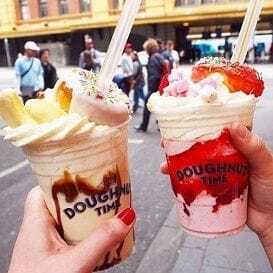 Doughnut Time opened its first Brisbane store in January 2015, and has since spun into 15 stores and counting across Sydney, Melbourne and the Gold Coast. The venture quickly attracted interest from Topshop executives - a brand known for trendspotting and creating popup concepts - and now Doughnut Time has three mini stores in Topshop Brisbane, Sydney and Melbourne. Griffiths employs over 300 people, of which 120 work for Doughnut Time. Doughnut Time alone is said to turn over $20 million. 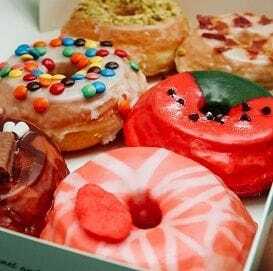 Griffiths doesn't buy into the idea donuts are a passing trend and, even if he did, he is too focused on building his entire group and 'not taking success for granted'. He started rolling out Mister Fitz's Finest Ice Cream in December, an ice cream sandwich concept, and says now it's all about tying the group together. "Our ventures have given us a platform to access a really cool customer base who are young and hip and want to keep trying new products," says Griffiths. "We've got the benefit of social media, where Doughnut Time alone has around 100,000 followers, and we receive feedback instantaneously. "My mindset is still small-time restaurateur, full-time hospitality customer. I'm faced with the challenge now to create a bigger group. "We're working on putting in place systems but still keeping the ethos and culture of how it all began, starting with the managers and funnelling this down to junior staff." Griffiths thinks restaurateurs and entrepreneurs from smaller places shouldn't be afraid to take the leap in this golden age of hospitality. "You should never be fearful if you're on the Gold Coast, for example, that you're not going to be cool elsewhere," he says. "Australians are by and large similar regardless of where they are, and generally it isn't a hard place.